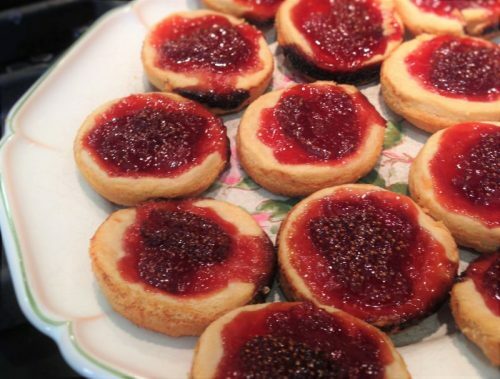 I’m amazed that jam tarts haven’t migrated to America, they are a staple on English tea tables, needing only pastry and fruit jam, preferably homemade from raspberries, tangy and brilliant red. For the pastry, you can either make your favorite dough, or try this crumbly English dough that uses butter and lard. 1. For the pie pastry: sift the flour with the baking powder and salt into a bowl. Cut the butter and lard in small cubes and add to the flour. Rub the fats into the flour with your fingertips to form crumbs. Stir in the water with a fork to make sticky crumbs, adding more water if necessary. Press the dough together with your fist to make a ball, wrap in plastic wrap and chill 10-15 minutes. 2. Heat the oven to 375°F/190°C and set a shelf low down; butter the muffin pans. Sprinkle the work surface with flour and roll the dough to ¼-inch/6 mm thickness. Stamp out 12 rounds with the cookie cutter. (Roll the trimmings of dough a second time to make the count.) Press the rounds gently down into the buttered muffin pans. Drop 1½ teaspoons of jam into each mold. 3. Bake the tarts in the oven until the pastry is lightly browned, 25-30 minutes. It may collapse slightly around the edges and this is normal. Let the tarts cool slightly in the pans before unmolding them. They are best eaten the day of baking but can be kept a day or two in an airtight container.